With the recent debate (yet again) among many CWCCA member breeders over the mating of blue merles to any color other than black, I thought it might be important to make available a number of historical photos, pedigrees and other information on the Winsdown dogs and their legacy. The Winsdown dogs figure prominently in many pedigrees now through the currently popular sire AM CH Coedwig's Carbon Blue, a namesake and descendant of the Winsdown foundation dog, Winsdown Brymore Carbon Blue. 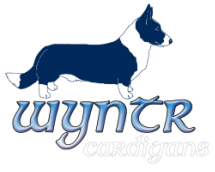 Throughout the history of the breed, cross-color cardi matings have occurred with or without the consent of their breeders. Although it may have been a relatively common enough practice in the past, very few current breeders have deliberately not only done such matings, but repeated them in subsequent generations. However, for some of the Winsdown dogs, this is exactly the case. Their breeder's reasoning for this, I have been told, was to both clearly determine the mode of inheritance of the merle color pattern and to improve on the overall conformation quality of the line, regardless of color. Loise Vantrease of the Winsdown kennel prefix is said to have likened herself to a 'mad scientist' in doing her cross-color breeding, but there was a method to her madness as a look at her dogs and her pedigrees now show. Most of the old photos and pedigrees displayed on these pages have been on loan to me thanks to Janet Jackson of Airdrie cardigans. Once belonging to Candace Powaga of the Agawop prefix, they were obtained by Janet when Ms. Powaga suddenly passed away. It was a fortunate thing that Janet acquired the books when she did because they might otherwise have ended up in the trash. Some of these images also came from Karen Harbert who additionally supplied part of the pedigree info I needed when I was researching my own dog's lines. Whenever possible gender, age, color and any other pertinent information are provided on these dogs as well as pedigree or parentage. Click on the links below to see them. AM CH Winsdown Carbonette - a regular blue merle with a red undercoat, possibly a brindle merle. Winsdown Crystaline Ginger - a 'ginger' merle (brindle merle). Winsdown Hydroxide - a brindle (out of blue x brindle parents). More pedigrees and photos will be added as I find the time and materials. Any additional information that anyone can provide to fill in the blanks on these dogs will be appreciated!